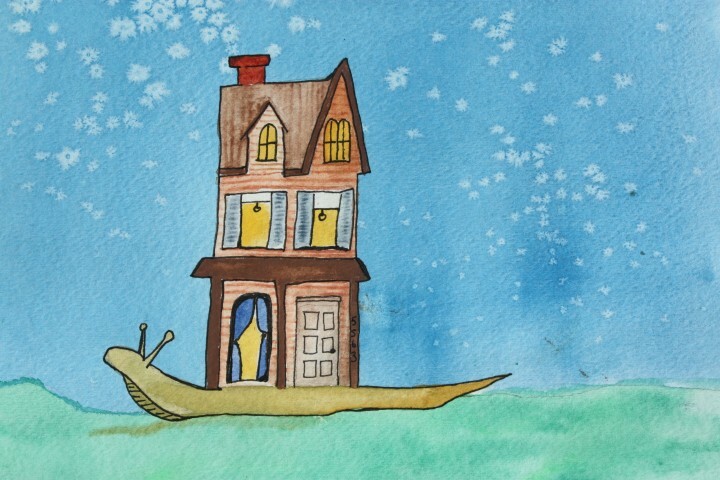 Using vibrant colors, spirited forms, and working in two-dimensional and three-dimensional mediums, the soulful snails of A Slow Journey Home are brought to life in a most unique way. Created with a combination of hand-built and wheel thrown techniques, the clay snails are like something that could leap from the pages of a fairytale. The watercolor pieces are painted with a resist technique that allows Mercedes to paint the background first, using a wet on wet wash to produce an atmospheric effect. When that is dry she returns to add the characters. The paintings and sculptures have small details in common that create an extraordinary level of depth that is contrasted with simple backgrounds. The tranquil landscapes will inspire audiences to take their own slow journey home.